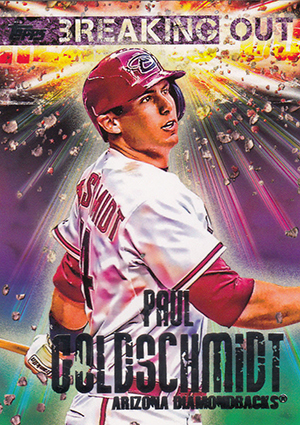 2014 Topps Opening Day Baseball is for those who want something simple and fun to collect. Don't expect "sick patches" or "big mojo hits." Instead, it's something for learning about players, collecting a team, building a set or enjoying an insert design. 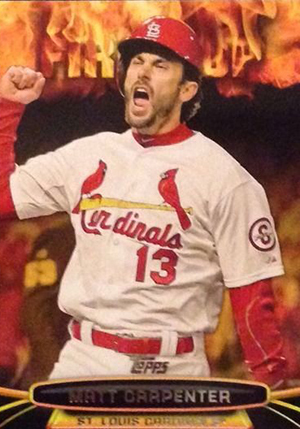 The main 2014 Topps Opening Day Baseball set has 220 cards. Like other opening day sets, the overall design is very similar to the year's flagship Topps set. To help differentiate the design, an Opening Day logo has been added to the front. The set also includes some updated shots to preview players that will be in 2014 Topps Series 2 Baseball. 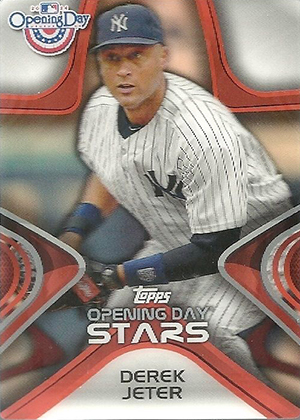 Besides the expect mix of big-name stars, the checklist has a handful of MLB rookie cards of players called up late in 2013. These include Xander Bogaerts and Taijuan Walker. The base set comes with an Opening Day Edition parallel. 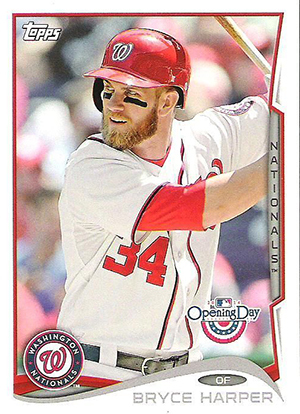 These cards, which are numbered to 2014, have a blue border and a foil stamp with the date of MLB's Opening Day. Every card also has four different one-of-one Printing Plates. Inserts combine to fall one per pack. 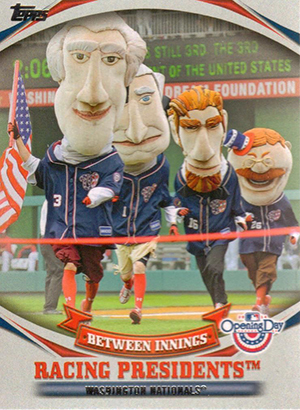 Mascots return. The set highlights 25 of the fun-loving, furry cheerleaders. Opening Day Stars use 3-D design to spotlight superstars. 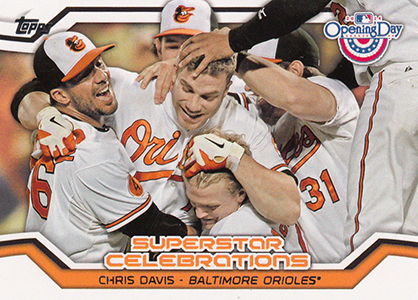 Superstar Celebrations (25 cards) captures the moments immediately following big moments, accomplishments and milestones. Keeping with a similar theme is Between Innings, a ten-card set that shows what happens at MLB stadiums after every third out. Breaking Out goes back in time to show 20 players on their Opening Day debuts. Finally, there's Fired Up, a set that shows what baseball fans already know -- that the game is exciting and has many animated players. 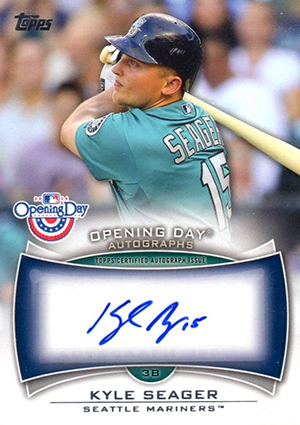 While not the main focus of the release, 2014 Topps Opening Day does have autographs and memorabilia cards. The main Autographs lineup has ten players, mixing superstars like Mike Trout and Wil Myers with smaller stars such as Todd Frazier and Kyle Seager. The set also has five Mascot Autographs. In 2013 Topps Opening Day Baseball, these turned out to be some of the most valuable cards in the set. 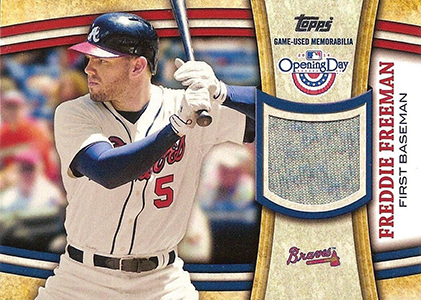 New to 2014 Topps Opening Day Baseball are randomly inserted Relic Cards. The ten-card set includes Derek Jeter, Freddie Freeman and 2013 NLCS MVP Koji Uehara. 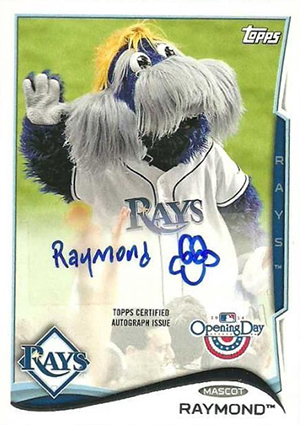 2014 TOPPS OPENING DAY WALLY THE GREEN MONSTER AUTOGRAPH CARD !!! 220 cards. Shop for base sets on eBay. 25 cards. Inserted 1:220 packs. Click here for a detailed list and images. 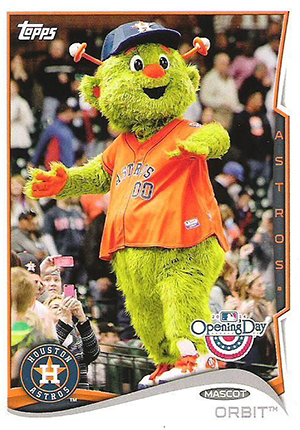 i love baseball cards and it is 2014 baseball opening day. Not sure why the Breaking Out of Cano still shows him as a Yankee, yet they show Joe Nathan in Tigers uniform and Choo in Rangers uni. They show Cano as a Yankee, because he “was breaking out” as a Yankee. Love the Breaking Out cards- they look old-fashioned. Lots of fun inserts. Great job this year! I got amazing cards out of these…one of them being an autographed ODA-MT Mike Trout card…OOOOOO BOI! My 8 year old son loves this set. Mascot cards, 3D cards have got him into collecting. Good price and a great set for kids. Bought an 11 pack retail box for $10 and pulled my first ever autograph card (Frazier) + several basic inserts. Fun set, will be buying more soon. Mike Elliott � Print runs were not announced. This is a product that isn’t broken by a ton of dealers or sellers looking to flip which means that they’re probably even tougher to find than they might normally be. Love the set, love the price point, no buyers remorse spending a $1 per pack! 2014 Topps Opening Day Baseball Hobby Box - Factory Sealed!